"Jansen’s Pelléas offers a rare instance in which the cliché about a singer ‘becoming’ his part is literally true. In physical appearance the very incarnation of a fairy-tale prince, Jansen had also, in his early years, the ideal voice for the role….With Jacques Jansen’s assumption of the role, the baryton-Martin took his place as the preferred Pelléas voice, by right of conquest. It was a classic case of supply and demand. The character of the music prescribed a voice that would sit comfortably in the medium tessitura where most of the writing lay, yet be able to strike high notes with youthful élan or passionate abandon, as the case required….With that opportunity before him, it was only a matter of time before the baryton-Martin developed sufficient range and tonal beauty to embody the character as Debussy envisioned him." "…Désormière’s performance [above], recorded in Paris during the occupation in 1941, has always stood apart as the never-to-be-surpassed version, definitive in cast, style, and an ineffable closeness to its sources: composer, language and text. The protagonists live their roles as no others since and they [also] have their connections to the original cast…." 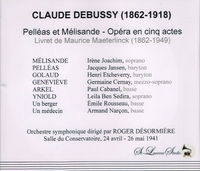 "Georges Truc was to have conducted the first complete recording of the [above] opera in 1941, but died just before, so that the distinction of directing what is still regarded as the touchstone for all PELLÉAS recordings, with a ‘classic’, well-nigh ideal cast (all native French-speaking), fell (worthily) to Roger Désormière. His Mélisande was Irène Joachim (grand-daughter of the great violinist), who had studied the role with Mary Garden and, along with Jacques Jansen, the Pelléas, had been coached by Georges Viseur, the répétiteur at the work’s first performance. She accommodates her silvery voice to every shade of verbal meaning, and subtly creates an impression of innocent simplicity….There is an unhurried, abstracted air about her singing as she combs her long tresses and a significant absence of urgency in her voice when she bids Pelléas release them."